As the leading artist of his day, Lucian Freud’s works are among the most recognised paintings in the world. But a major new exhibition of his drawings and watercolours will feature rare, previously unseen works, including intimate portraits of his parents, children, self-portraits and childhood etchings. Among the works that will be shown for the first time is Birds in Tree, a crayon sketch believed to date from 1930 when Freud was seven. Thought to be one of his earliest surviving works, the colourful drawing was kept by his devoted mother, Lucie, who recognised her son’s talent from an early age. Another rare work included in the exhibition is a tender portrait of Freud’s first wife, Kitty Garman, the daughter of the sculptor Jacob Epstein, cradling their first-born child, Annie. Sketched on a scrap of notepaper in 1949, Mother and Baby was drawn when Freud was 26, following the birth of his daughter the previous year. The image suggests familial harmony and Freud revelling in fatherhood - themes that was not to last in his notoriously colourful private life. Garman and Freud divorced in 1952 when the artist embarked on an affair with the socialite and novelist Lady Caroline Blackwood, who became his second wife in 1953 just a year after his second daughter, Annabel was born. Freud went on to have 11 more children with four other women. The art critic William Feaver, a close friend of Freud’s and curator of the show at the Blain Southern gallery in London, who worked with Freud on the exhibition for several years before his death last year aged 88, said that Freud had recognised the work as one of his favourite drawings. He said: “It is a very touching Madonna and child image, every stroke is completely alive. Lucian was looking this baby, a very curious object to him at the time, and capturing all of Kitty’s maternal feelings pouring out. 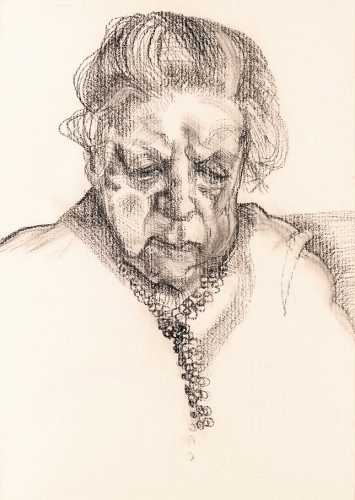 The show will also feature intimate, unseen portraits of his parents, including Freud’s teenage sketches of his mother and a watercolour of his father, Ernst, on his death bed. Ernst, an architect and the youngest son of the psychoanalyst Sigmund Freud, was said to be concerned for many years about his son’s career path and complicated private life. He died in 1970, aged 78, before Freud achieved international acclaim as Britain’s greatest artist. A self-portrait from 1961, painted in watercolour during a holiday in Greece when Freud was 38, will also go on display for the first time. Lucian Freud: Drawings, which opens next month, will also feature landscapes, studies of animals and portraits of some of his closest friends, including the artist Francis Bacon. More than 100 works will be loaned by international museums, private collections and Freud’s own estate. Feaver said: “The interplay between the works on paper, both drawings and etchings, and the paintings of the past 70 years was crucial to his artistic achievement. An unfinished portrait of the late playwright, Harold Pinter, from Freud’s own collection, will also be exhibited. Pinter sat for Freud twice during 2007, but died of cancer the following year.